Review by AllTheBestFights.com: 2018-03-31, one sided fight between Josh Kelly and Carlos Molina: it gets two stars. The undefeated olympian Josh Kelly entered this fight with a perfect boxing record of 5-0-0 (4 KOs=80%) and he is ranked as the No.94 welterweight in the world. He started his professional boxing career last year winning over Jay Byrne, Jony Vina, Tom Whitfield, Jose Luis Zuniga and Jean Michel Hamilcaro. His opponent, the former Ibf light-Mw champion Carlos Molina, has an official record of 28-8-2 (8 knockouts) and he entered as the No.42 in the same weight class but he comes off two consecutive losses: against Carlos Adames and Ahmed El Mousaoui; his last victory occurred at the end of 2016 with Diego Cruz (Carlos Molina vs Diego Cruz). 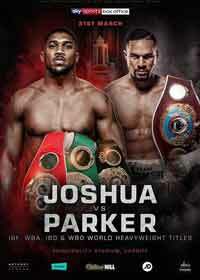 Kelly vs Molina is valid for the vacant WBA International welterweight title; undercard of Anthony Joshua vs Joseph Parker. Watch the video and rate this fight!